Ancho Chile Peppers: Pronounced AHN-choh. 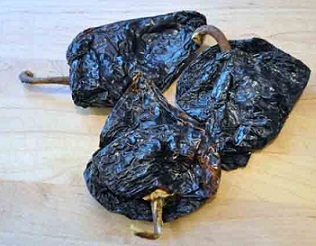 A dried deep reddish brown chile pepper about 3 inches wide and 4 inches long with a sweet hot flavor. When fresh they are referred to as poblanos. They look like small bell peppers. Anchos are flat, wrinkled, and heart shaped. They range in color from very dark red to almost black. Anchos are mild to moderately hot and often soaked and ground for use in sauces. Making homemade ancho powder is so easy to do. Just purchase whole dried Ancho Chiles and grind them into a powder. First cut the tops of each Ancho chile pepper that you are using. Then slice them in half lengthwise. Remove all seeds and discard them from the inside of each Ancho chile pepper. Using a coffee grinder or a food processor, grind until you have a powder. You now have Ancho Powder!